Front de Gauche (France) leader Jean-Luc Melenchon with SYRIZA (Greece) leader Alexis Tspiras. May 20, 2013 -- International Viewpoint -- The situation of the "lefts" in Europe cannot be understood without starting from the crisis, its multiple dimensions and its effects on the social and political field. Hitting head-on all the organisations and parties linked to the history of the workers’ movement, precipitating ruptures, it obliges political forces to recompose around new axes. May 8, 2013 – Links International Journal of Socialist Renewal/The Bullet -- France’s National Assembly and Senate have voted to extend the country’s military intervention in Mali. A resolution passed both houses of parliament on April 22. Not a single vote was cast in opposition. Three days later, the United Nations Security Council approved Resolution 2100, creating a policing mission beginning July 1, 2013. The mission is called by its French acronym MINUSMA. Its projected size is 11,200 soldiers and 1440 police. 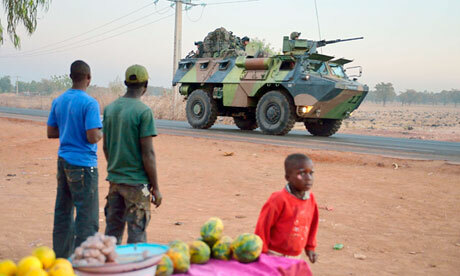 French troops arrive in Mali. 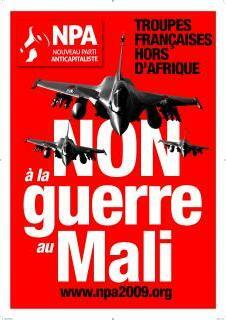 February 26, 2013 – Links International Journal of Socialist Renewal -- France perpetrated two large deceptions in conducting its military intervention into Mali six weeks ago. These have been universally accepted in mainstream media reporting. The first is that the unilateral decision to invade Mali on January 11, 2013 was hastily made, prompted by imminent military threats by Islamic fundamentalist forces against the south of the country where the large majority of Malians live. France: As Hollande takes the social-liberal road, what prospects for the left? 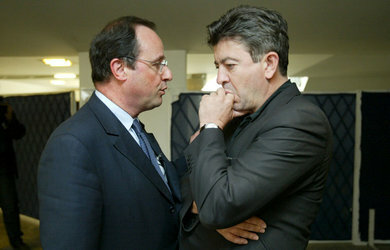 France's Socialist Party President Francois Hollande with the Left Front's Jean-Luc Melenchon. February 7, 2013 – KritiskDebat (Denmark ) and Links International Journal of Socialist Renewal -- It is just over seven months since the Socialist Party’s Francois Hollande capped his victory in the presidential elections by winning a working majority in the elections to the National Assembly. It probably seems longer to him. It has been a hard half-year. Hollande won the election by standing on a program that was distinctly on the left by the standards of the Socialist Party. Partly this was to position himself as a clear alternative to his conservative opponent Nicolas Sarkozy. To a not insignificant degree it was to hold the SP electorate against the strongest challenge from the left for thirty years, in the shape of the Left Front (Front de gauche) and its presidential candidate Jean-Luc Melenchon.